Manchester City reduced Liverpool's lead at the top of the Premier League table to four points. 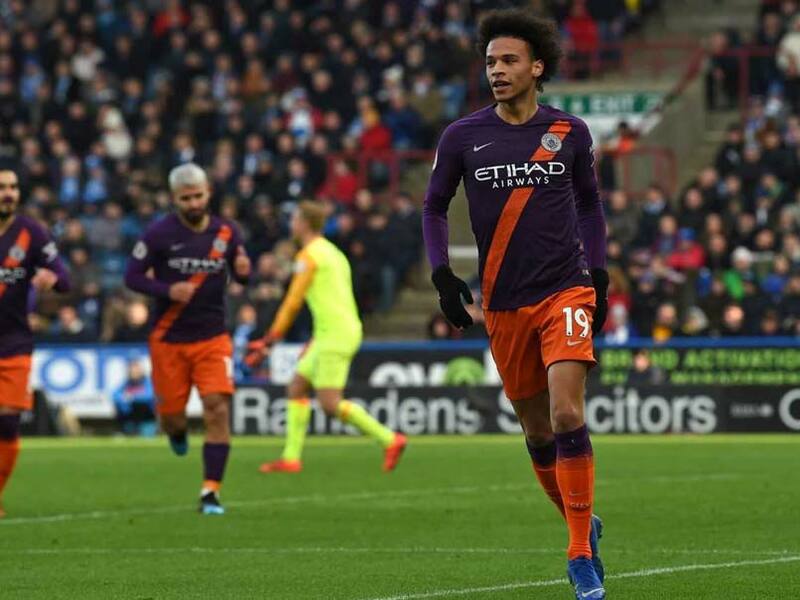 Manchester City reduced Liverpool's lead at the top of the Premier League table to four points as they eventually found top gear to win 3-0 away to basement club Huddersfield Town on Sunday. This was by no means City's most outstanding display of the season but, ultimately, goals from Danilo, Raheem Sterling and Leroy Sane ensured they did not trip up in the latest leg of their quest to keep the Premier League title-race alive. Meanwhile, Tottenham Hotspur bounced back from their defeat to Manchester United in their previous outing thanks to a last-gasp goal from Harry Winks to beat Fulham 2-1 at Craven Cottage. Liverpool's captivating 4-3 victory over Crystal Palace on Saturday ensured this was a crunch fixture for Pep Guardiola's side, yet any hopes Huddersfield could pull off a shock win never materialised. They parted company with manager David Wagner on Monday, a mutual decision but a sad one for Terriers' fans who will always remember him as the man who not only secured promotion to the Premier League for the Yorkshire club but also kept them in the top-flight last term. A repeat of that looks highly unlikely this season and this match pitted the Premier League's highest scorers against the lowest, with Huddersfield having netted just 13 times going into this encounter and having lost eight of their last nine league games. After 12 minutes, Sterling felt he was denied a penalty after Terence Kongolo's heavy challenge in the box. But City's wait to break the deadlock lasted just six more minutes as Danilo's fierce shot was deflected past Jonas Lossl by Christopher Schindler. An emotional message from Wagner was broadcast on the big screen at the John Smith's Stadium during the half-time interval and that comfortably eclipsed most of the entertainment offered in the opening period. City's afternoon soon got even better when Sane then scored a wonderful team goal that demonstrated how City had finally woken up. In the day's final clash, Tottenham looked set to fail their first test without the injured Harry Kane as his deputy Fernando Llorente made an unwanted impact at the other end with an own goal to hand Fulham an early lead. However, after Winks burst into the box to meet substitute Georges-Kevin N'Koudou's cross with virtually the last touch of the game, Spurs tightened their grip on third. They have the cushion of a seven-point advantage over fifth-placed Arsenal and Manchester United in the race for a top-four finish. Fulham on the other hand are seven points off safety and look set to return to the Championship after just one season back in the top flight.